Saffron is basically a flowering plant which is widely used as a culinary spice. It is also used in herbal supplements due to its varied health benefits. Right from treating depression, asthma, atherosclerosis and stressful menstrual cycles, saffron’s benefits extend to even treating cancer and helping to lower bad cholesterol levels. Saffron is in fact, an expensive spice made from the saffron crocus flower. Research indicates that a few compounds in saffron do promote anti-cancer activity. It also helps in stimulating the secretion of stomach acids which supposedly assists in the contraction of muscles, for instance, as in the uterus. Reddish golden in color, saffron is used basically as a seasoning agent in cooking and also as a coloring agent. In fact, saffron is one of nature’s highly powerful herbs. From time immemorial, saffron is known to have helped relieve stomach aches and kidney stones. It also improves circulation of blood. A vital herb with multiple benefits, it is believed that in ancient days, grand moms used to mix a few sprigs of saffron in hot milk as a night cap for their grand children, to induce sound sleep and good health. It’s been scientifically proven that saffron contains carotenoids which play a vital role in inhibiting skin tumors, improving vision and relieving aches and pains of arthritic conditions. It’s been proven after a recent trial that this aromatic golden herb may prove instrumental in preventing loss of vision in the elderly. This is a proven fact in scientific circles that saffron helps to regain vision in the instances of cataract. Saffron contains a compound by the name “crocin” which is helpful in promoting learning, memory retention and recall capacity to a great extent. Several studies have shown encouraging results that saffron might be great in the treatment and management of age related mental impairment. Saffron contains certain active constituents which are known to produce positive effects in patients suffering from neuro degenerative disorders. In case of soreness or inflammation of the mouth and tongue, try massaging gums with saffron. Discomfort is relieved almost immediately. Medical studies over the years have proven beyond doubt that this golden herb enhances oxygen diffusivity in plasma and other liquids. It also improves pulmonary oxygenation. High levels of bad cholesterol and triglycerides can be lowered by including saffron as a dietary intake, or as an herbal supplement. For those suffering from conditions of acute dryness of skin, application of saffron cream typically on affected areas will help relieve the symptoms. In combination with other herbs, saffron is also reputed to be a good remedy for insomnia, coughing, indigestion and even baldness. How to find out genuineness of saffron ? While buying saffron, to ascertain its genuineness, and to find out whether it is fake or adulterated, immerse a tiny piece of it in warm water or milk. If the milk or water colors immediately, then it is adulterated. Genuine saffron takes about ten to fifteen minutes of soaking in warm water or milk before it can turn a deep red color or emanate a wonderful aroma. As mentioned previously, this highly valued spice helps to protect your eyes from being damaged by harmful UV rays. It is known to slow down considerably the progression of eye diseases like macular degeneration, which can in turn cause blindness. Saffron has unique compounds like crocin and safranel which belong to a family of carotenoids. This includes beta carotene and this is which gives saffron it’s color. Not only do these compounds play a major role in preserving eye sight, they possess anti cancer properties too. Besides, they help prevent Alzheimer’s disease. Studies reveal encouraging reports regarding macular degeneration patients, who were fed on a diet containing saffron, and they began showing signs of cell recovery and improved vision. Saffron affects the genes, regulating the fatty acid control of the cell membranes, which in turn makes vision cells tougher and resistant. The compounds of crocin and safranel have anti tumor effects as well. Saffron greatly boosts immunity by aiding in the maturation of white blood cells, as well as accelerating the levels of enzymes that help the body to track down toxins. 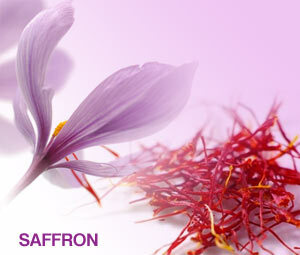 For those suffering from acute premenstrual syndrome, saffron is like an answer to fervent prayers. It eases irritability, depression, and mood swings, symptoms typical to this syndrome. Apart from numerous health benefits, saffron when added to a dish turns it into a truly exotic one, with appetite enhancing aromas wafting out of it. Even as it boosts the appetite, it improves digestion too. It’s a well known fact that this spicy aromatic herb is used in the treatment of kidney, bladder and liver disorders and also assists in improving circulation to the digestive system. While coating the membranes of the stomach and colon, saffron gently aids in soothing symptoms of gastro intestinal acidity and colic. For those afflicted with gastro intestinal disorders, acidity and related problems, saffron is like the boon from high heavens. Over ninety disorders can be treated using this wonderful golden spice. Saffron is a great blood purifier and displays anti-inflammatory properties too. For those afflicted with severe inflammatory arthritis, intake of saffron provides relief from joint pains. Saffron is just great for athletes as it eases fatigue and muscle inflammation by aiding tissues to get rid of lactic acid, which gets stored in joints after strenuous exercise regimen. It has mild sedative properties and can be safely used to provide ample rest during influenza and fever, and also to cure insomnia. Saffron helps in stepping up of oxygen content in blood, promoting over all health and well being in a person. This golden spice is a highly plausible remedy for a variety of illnesses, ranging from fatigue, sore gums, to heart disease and cancer. Research studies on saffron continue to reveal yet more eye opening results to benefit the human race. Saffron does more than just add flavor and color to food. It can proudly boast of a three thousand year history of medicinal uses. This aromatic spice can even speed up the healing of burns and cuts. It is the anti inflammatory properties of saffron that is responsible for speeding up the healing process. This amazing spice is always full of delightful surprises and can, over the years greatly benefit man kind in an amazingly astounding manner.